The Place Do we need another Keisuke concert? Apparently yes, as Keisuke Group’s 19th outlet is going to open at Paya Lebar Square on 1 April, known as Charcoal-Grill & Salad Bar Keisuke. The restaurant is located at the basement of the mall, directly linked to Paya Lebar station. As with most Keisuke concerts, the 33-seater space is not huge, where you can expect a queue during peak hours. This new concept is all about Sumiyaki, also known as charcoal grill, with a huge focus on charcoal grilled Japanese fishes at affordable prices. The 18th restaurant also recently-opened in the same mall, Tendon Ginza Itsuki, which is the second of its concept. It seems like 2019 is an expansion year for the group, with Omurice Keisuke in Bugis+ which opened earlier in January. The Food The cheapest set on the menu is the Charcoal Grilled Chicken with Rock Salt Set (S$9.90), where every set ordered also comes with miso soup, an onsen egg, Japanese rice cooked in a small iron pot, and access to a free-flow salad bar with more than 30 types of Japanese side dishes. Sounds like incredible value, are they even making money? That said, the Japanese fishes are the highlight here so I would recommend going for those. 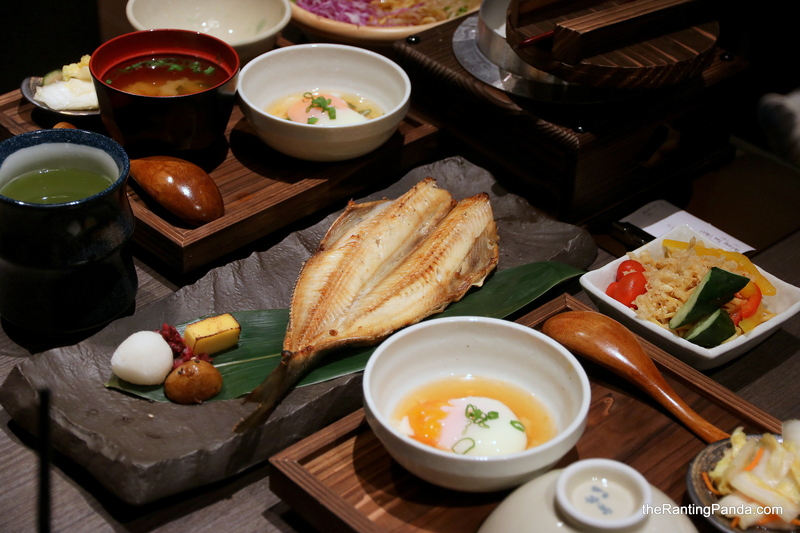 There are various types of fishes on the menu such as salmon, mackerel, yellow tail and black cod fish, all done in different types of marination and sauce before being grilled over the Japanese imported binchotan. I had the Charcoal Grilled Miso Marinated Black Cod (S$21.90), which also comes with some small side dishes like cheese and potato. The cod fish is very flavourful and relatively fatty in flavour. Each part is evenly cooked, while the portion is just right for me. For the onsen egg, you can either have it on its own or mix it with the rice. Another fish I tried is the Charcoal Grilled Salmon Belly Set (S$16.90). Go for this is you love fatty salmon, as the salmon belly is very fatty in flavour, not in a bad way. That said, there is probably too much omega 3 fish oil that it can get a tad greasy after having too much of it. I suggest sharing this with someone, or do a swap with your dining partner to try another type of fish or chicken. Comparatively, the Charcoal Grilled Homemade Fish Cake Set (S$10.90) is a more humble take on the menu if you do not want to spend that much on the more premium types of fishes. It comes with small slices of the fish cake, which makes it easy to share as well. For the free flow salad bar, my top picks are the tofu, dandan noodles and potato salad. Does this remind you of the salad bar at Hamburg Steak Keisuke? Rants The glass panes of the restaurant makes the dining experience less private, which is easy for curious bystanders to peer. As per all Keisuke outlets, no reservations are accepted. Will I Return Again? Prices are extremely value for money at Charcoal-Grill & Salad Bar Keisuke, which is a good option to have Japanese food in the east. Fortunately, the quality of the dishes and salad bar are not compromised.